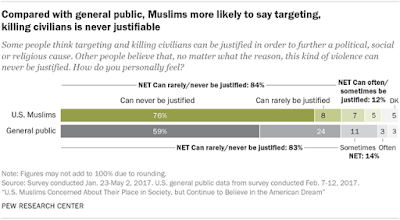 A new Pew poll on US Muslims came out earlier this month and I think it is absolutely fascinating. There is much focus on the way Muslims see themselves in the society and those results by themselves are interesting. 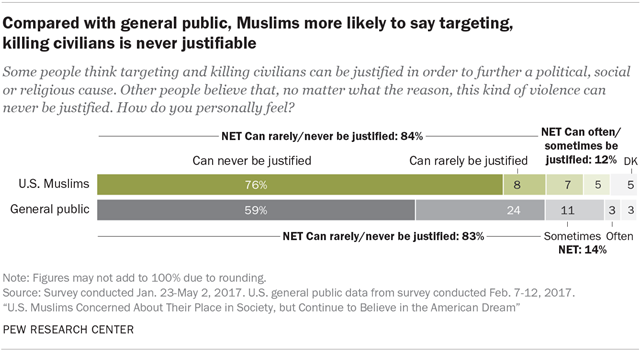 For example, close of half of US Muslims report personally experiencing a case of religious discrimination in the past year. However, about half also report that they received expressions of support for being a Muslim. Both of these numbers are significantly up from 2007. But couple of things that caught my attention. First of all, the opinions on religiosity are fascinating. 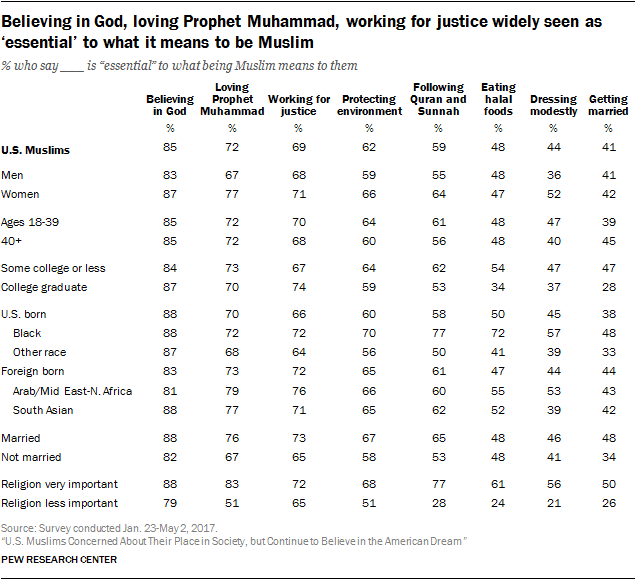 About 60% of US Muslims identify themselves as "religious". The remaining are split evenly between "spiritual but not religious" (19%) and "neither spiritual nor religious" (21%). Now this last category reminds me a bit of the growing category of "Nones" - people who do not identify with any religious tradition (about 23% of US population). Now of course, here they are identifying themselves as Muslims (and 15% in this category consider religion "very important") and will be interesting to get an insight into this population. 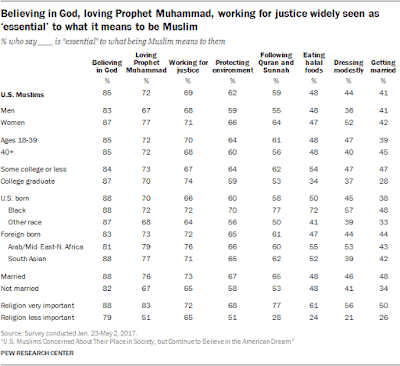 Now the respondents were also asked what they think is "essential" for being a Muslim. Not surprisingly, 85% considered Belief in God as being essential - though 15% did not and may be the ones who are "neither religious nor spiritual". Love of the Prophet Muhammad (PBUH) is next. 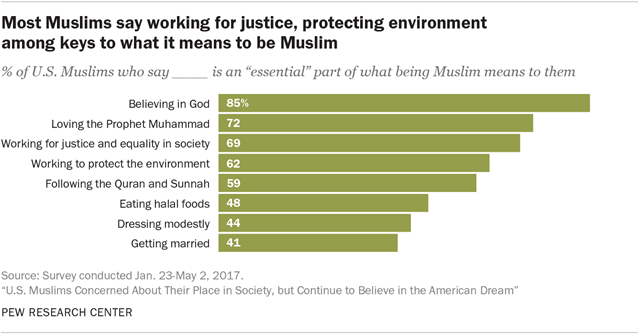 But then it is followed by "Working for justice and equality in society" (69%) and then "working to protect the environment" (62%) before we get to "Following the Quran and Sunnah". Just by comparison, only 22% US Christians thought that working to protect the environment is essential to their Christian identity. So instead of "creeping Shariah", the worry should be creeping environmentalism? Considering that 66% of US Muslims identify themselves as Democrats and that they are also likely to be more educated than the US general population, it is perhaps not surprising that the acceptance of homosexuality is high. However, the rate of change is striking and - again - this is something worth exploring. There is a lot more to explore in the survey. You can read get the full pdf here. The DKIST’s ability to investigate the solar eruptions that can endanger electric grids and communications may be one reason why it received more public support than the TMT, which is solely a research tool, Hasinger says. But he believes a more important difference between the two projects is simply their scales. At 18 stories, the TMT would be not only the largest telescope on Mauna Kea, it would be the largest humanmade structure on Hawaii Island. The TMT’s footprint—2 hectares including its roads and parking lot—is 10 times the size of the plot used for the DKIST. “It’s just a huge structure,” Hasinger says. “In relative size you could say it’s similar [to the DKIST], but in absolute size it’s much bigger.” Moreover, Mauna Kea is not only higher than Haleakalā, it’s the highest peak in the Pacific—and, consequently, it offers Native Hawaiians a higher-profile platform to air their grievances. The organizations behind the two projects are very different, astronomers note. 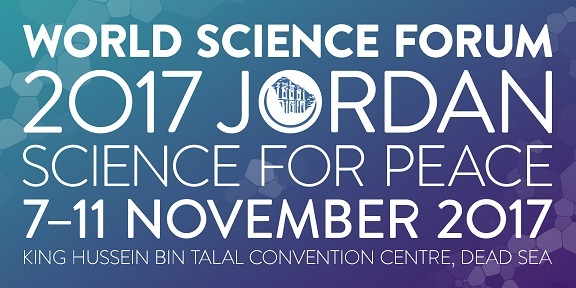 The DKIST is a national project, funded by the National Science Foundation and owned by NSO. Using federal funds meant that NSO had to follow strict accounting procedures, perform a federal environmental impact assessment, and satisfy U.S. historic preservation rules. By contrast, the TMT, a private consortium supported by institutions in five countries, received no federal funds for construction. That meant it didn’t have to deal with those same regulations. “The opponents were able to sell it as this foreign company coming in and basically using our mountain for their purpose, whereas [the DKIST] at least is a national interest,” Hasinger says. The groundbreaking ceremonies for the two projects reflected the stark differences in their characters—and also exposed their different vulnerabilities. Kuhn remembers going as a guest to the TMT ceremony in October 2014. He stayed at a fancy Hawaii Island resort, surrounded by scientists and media from around the world, as big-screen TVs ran a live feed of the TMT’s construction site on Mauna Kea. 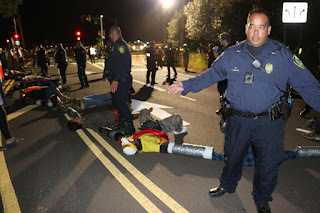 But the celebratory atmosphere faded when Native Hawaiian protesters blocked a convoy of dignitaries heading up the mountain for a blessing and groundbreaking. 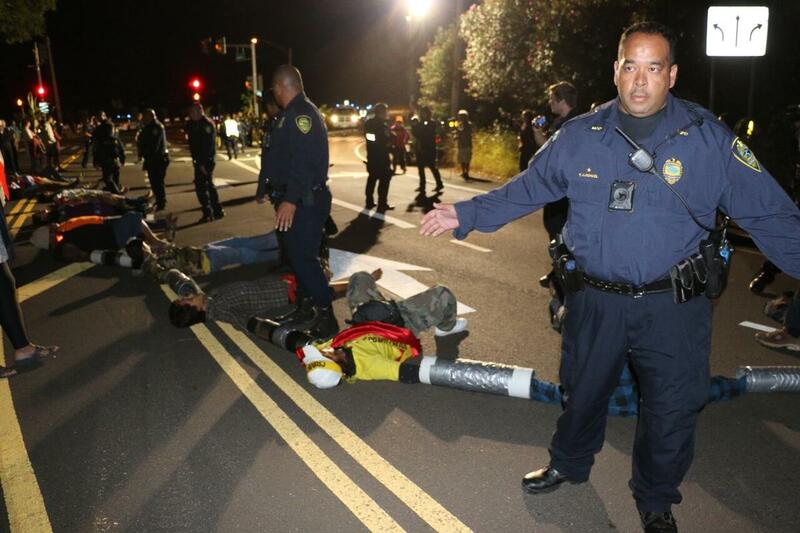 As protesters shouted and chanted, organizers eventually turned off the live feed. “It was a disaster,” Kuhn says. 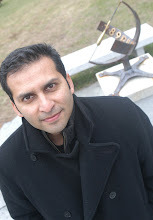 “I understand why they wanted a great big party—it was a way of saying, ‘Yes, we’re moving forward, partners, come and join us, and bring your checkbooks.’ But I think it had the opposite effect, which was to put up a lightning rod that attracted lightning.” The event “marked real doubt” about the project’s future, he recalls. TMT Executive Director Ed Stone, who is also a professor at the California Institute of Technology in Pasadena, concedes the event didn’t go as planned. “Certainly whatever groundbreaking there was could have been done better than what happened,” he says. In contrast, the groundbreaking ceremony for the DKIST, in November 2012, was kept “very private,” with only a handful of people closely involved with the project, Kuhn says. “I think there was an honest sensitivity to those people who felt strongly that it shouldn’t be there,” he says. Furthermore, the access to Science City on Haleakala is much more controlled than the Science Reserve on Mauna Kea, and there is the presence of the military as well. All of this makes protests and blocking of roads much more difficult. Nevertheless, for a while the protestors were successful, before the equipment got to the telescope. Lets see what happens next. But I think there will be a lot more activity about TMT on island next door.